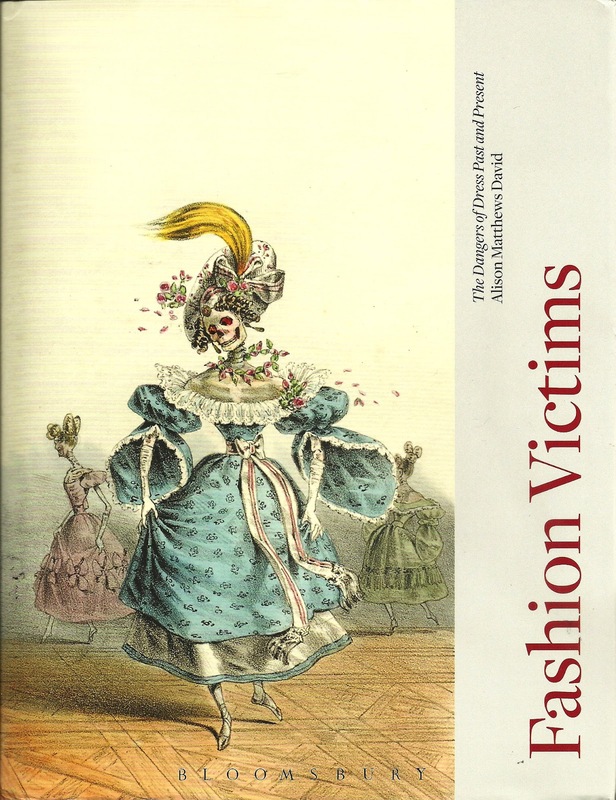 Fashion Victims is a collection of very interesting facts, folklore, and, sometimes dangerous misconceptions in the history of textiles and fashion. We know the textile industry has a somewhat dubious history concerning the safety of its workers (see my blog series “Slavery in the Factory”) and many early textile techniques relied upon the use of potent chemicals and unsanitary practices. But there is much, much more hidden in the closets throughout fashion history. From time to time, I will share some of these, often gruesome, tales. Today I wish to consider one short piece of fashion history presented by the author. I had never considered the wearing of long skirts in the late 1800’s and early 1900’s as a potential health concern ( beside the obvious tripping hazard when crossing the street) but Alison David discusses the scenario of fashionable women dragging their skirts through the filthy city streets. We all have heard accounts and seen pictures of the unsanitary conditions prevalent in large cities at that time ( and, I might add, today in some sections of our modern cities). The streets were clogged with horse drawn carriages, and anyone who has mucked a stable can attest to the obvious problem here. Waste water was thrown from windows onto the street below and there was no shortage of animals, vermin and other distasteful elements present. Obviously, the hems of the garments would inevitably become soiled and dusty and all those little microbes would then be carried into the family parlor. The idea of the germ theory, was just a theory, and most people had little idea of the potentially dangerous consequences of their ordinary lifestyle. We live in a very different time. The other day I stopped to buy some bathroom cleaner at a big box store. There were 4 long aisles, floor to ceiling, with products to clean, disinfect and sanitize the home. Rows of detergents for the washing machine, bleaches and stain removers shared space with floor cleaners and carpet steamers. Soaps for your body and dishes were next to several rows of hand sanitizers and wipes containing bleach, presumably to be used to destroy any virus, bacteria or other harmful pathogen. Next came the insecticides and pest control products. Good grief, I thought, we must be the most sterilized civilization ever. But, how clean are the clothes we buy? When you purchase items do you immediately go home and throw them into the washing machine? After all, where have these items been? From fiber through manufacture of the cloth, to the cutting and sewing of the garment, through packaging and shipping and finally arriving at the retail establishment there have been dozens and dozens of contacts with the environment and the textile workers. Of course this can be said of anything we purchase, from TVs to corn soup. But I might throw a bit of cautionary advice. Be aware that clothing can be a conduit for those little “germies” we cannot see. When we try on jeans to find the perfect fit, we surely know that perhaps others have been in that same dressing room, or that those jeans may have been returned after purchase. Perhaps judicious use of those products at “big box” is a fairly good idea.